I was playing poker the other night and as happens often in No Limit Texas Holdem my entire stack was taken in a single hand. There was close to $1,200 in the post with just about half of the chips coming from me. I was holding a pair of 10's and my opponents had Ace-King and King-2. The final card to be turned was a King, and I lost the hand along with my stack. Many people would look at this as a terrible situation (and it certainly felt like it at the time). However, I had all my money into the pot with 5 cards to go as a statistical favorite to win the hand. There were only 5 cards, the 3 remaining Aces and the 2 remaining Kings, in the deck that could have beaten me. If I was offered to make this bet 100 times in a row, I would take it every single time. This thinking is common sense for someone who regularly plays poker but may seem strange to someone unfamiliar with the game or general statistical theory. I find myself applying the logic used in poker to other aspects of my life. While I was driving home tonight I purposefully made a slightly illegal turn onto a one way street (the wrong way) and then immediately continued straight down another street. It is tough to explain this scenario in writing but there is no possible way someone can get hurt by me making this action, there is only the chance that a police officer catches me in the act. That is exactly what happened. 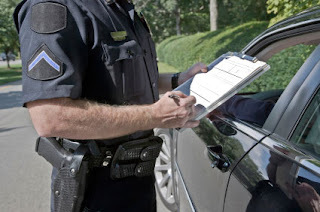 As I made the move a police officer was coming down the side street and caught me red handed. He pulled me over and proceeded to give me a ticket. Here is why I tell this second sad story. The first thing I thought of was whether or not I will choose to make that same exact move the next time I am in the same situation. Most people would certainly never make the same move the next time they approached that turn due to the law of recency - when an event occurs recently it tends to have a greater impact on decision making in the near future. However, my initial thoughts were a calculation on the time I save driving making the move vs. the likelihood that I will get caught making it and the cost I will incur when I get caught. I've probably made this move close to 30 times and this was my first time getting caught. So right now we'll use 1 out of 30 as our number. Additional data would obviously help this (and any) extrapolation on odds. What if the ticket cost me $75 (including the impact to my insurance). That means that making that move costs me $2.50 every time I do it. Is that worth it? Probably not. What if the ticket cost me $30. It would cost me $1 every time I do it. Is that worth it? Maybe. It depends how much value I put on my time. I don't know the cost of the ticket price yet (it will come in the mail), so I only have the ability to speculate before it arrives. Here's another example that's easier to understand. I have a friend that works for a big name tech company out in San Francisco. The owner of the company, one of the original Google employees who has already created another company and is worth millions, puts an emphasis on the value of time for his employees. 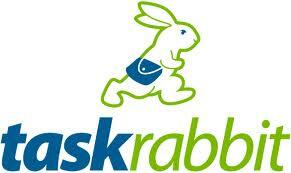 He forces his staff to run every possible minor task through a website called task rabbit. People at the site bid on your service (like a reverse eBay where the price to complete the task is bid down). For example, the cost to take your clothes to the dry cleaners could be bid down to $10. Imagine my friend makes $250,000 per year. With 2,080 working hours per year (if he takes no vacations), his working hours are worth $120. Let's say that he takes 4 hours per week to wash his car, clean his house, get his clothes dry cleaned, and take care of his yard. He puts a $480 price tag per week on these services by taking his own time to do them. What if he task rabbited these 4 tasks instead and spent those 4 hours working and adding value to the company? My guess is that he could task rabbit those items for close to $200 per week. Ah you say, but this is only calculating his working hours, not his free time. Okay, let's say that he sleeps 8 hours per day. That means every hour he is awake, 7 days a week, is worth $43. How many tasks that take him an hour during the week can he task rabbit for less? I bet a lot. This scenario shows that the more he uses task rabbit (pays other people) the more money he makes total at the end of the year while providing him more time to focus on other things like friends and family. I spend a tremendous amount of time studying behavior psychology and statistical outcomes (through poker and the financial markets), so it has a way of blending into my "real" world. I wanted to provide my thoughts on some of these basic ideas to show you how they can be viewed through a different lens. One of the more interesting parts of the Fed's recent addition to the QE-ternity program, initially discussed here, is that it is now tied to the unemployment rate. This has been dubbed the "Evans Rule." The Fed has promised to keep pumping at least $1 trillion ($85 billion per month x 12) of freshly printed currency into the system every year until the unemployment rate reaches 6.5%. It currently stands at 7.7% today. The second part of the equation, which they announced over the summer, is that the Fed will continue to keep pumping money into the system until the inflation rates reaches and stays above the 2% annual mark. The notion of both of these two goals, to somehow tie them to printed money in the system, is pure lunacy for reasons I hope long term readers of this site understand. We'll look beyond how this obviously will hurt the health of the economy in the long run and focus on how it will impact the financial markets; specifically gold. 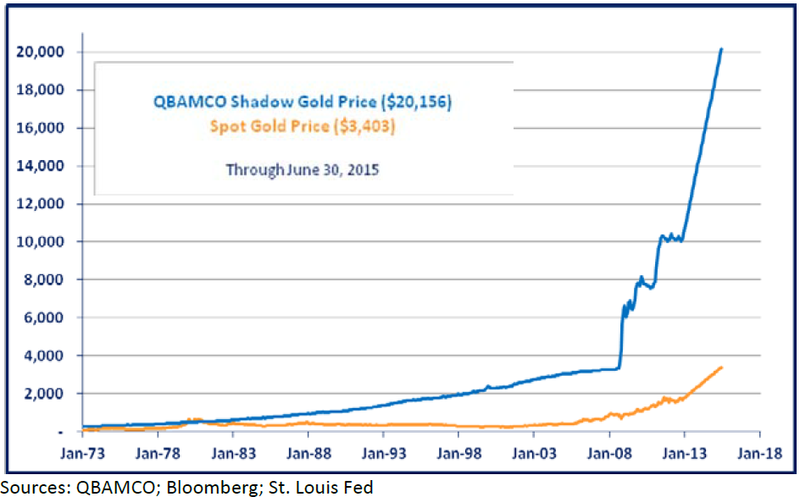 Gold has initially sold off on the addition of the QE-ternity program which has left many perplexed. There are countless reasons for short term moves in the gold market but one of them can be tied directly to the announcement of the Evans Rule. Market participants feel that the unemployment rate can reach 6.5% a lot sooner than the point they initially thought the Fed would slow down their printing. Readers here understand that the unemployment rate, based on the way it is calculated, is only a piece of the true health of the actual employment market. This is due to the simple fact that when workers are unemployed for so long they give up looking for work. At this point they are no longer counted as unemployed and the unemployment rate falls. The following graph shows the labor force participation rate, the percentage of Americans that are actively looking for jobs, since the 1950's. You can see that the participation rate was very low during the 1950's and 1960's. Did this mean that an enormous amount of people had "given up" back then and the economy was very unhealthy? No, it was the exact opposite. The 1950's and 1960's period was the peak point of America's economic greatness. It only took one income to support an entire household, meaning that a mother could stay at home and take care of the children. They were not part of the participation in the job market - for good reason, they didn't need to be. The steady rise in the participation rate was the slow and steady rise of women into the work force. While women are proud of the fact that they are part of the working population today, I assure you that many would prefer to have the choice in going to the office every day. Many would rather have the option of staying home with their young children. That option is gone today. 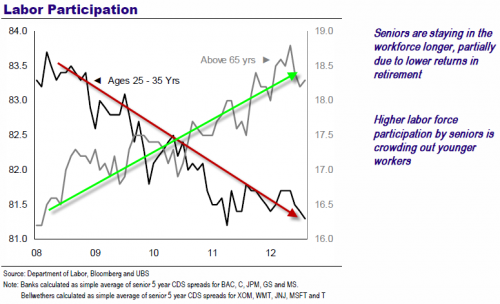 People consider the fall in the participation rate since the peak in 2000 contributed mainly to baby boomers retiring. We know that the largest number of boomers hitting retirement age did not begin until 2010. We also know that a tremendous amount of boomers that planned on retiring have now extended their working years due to the financial crisis. 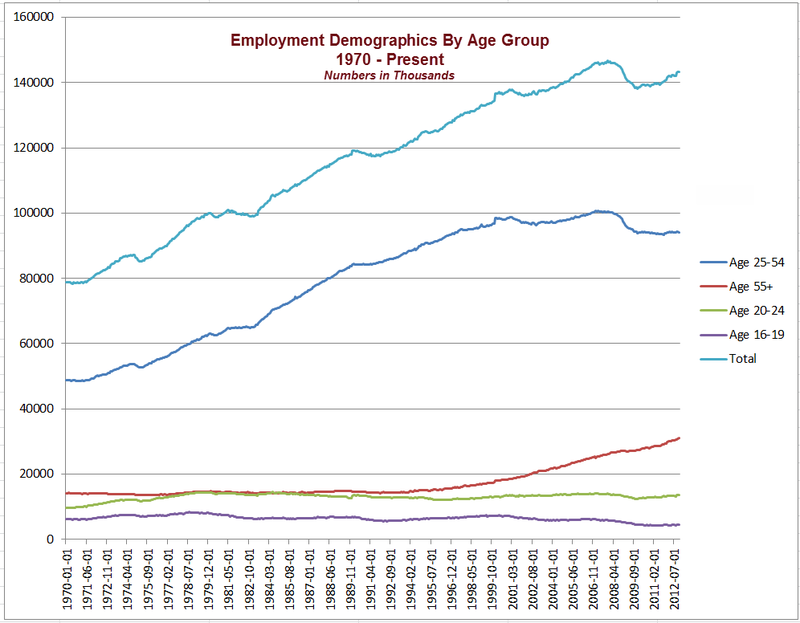 The following chart shows the employment demographic by age since 1970. 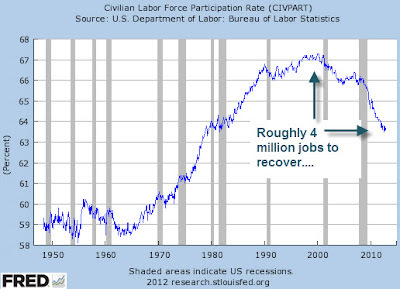 Pay particular attention to the portion of the graph since our "recovery" began. 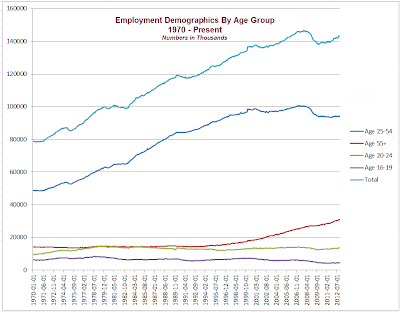 You can see that those aged 55 plus (red line rising) have been the major addition to the jobs market taking over 4 million new jobs during this period. The major losses in jobs have come from those aged 25 - 54 (dark blue line that peaked and then fell once the crisis hit - they have lost their job). Here's an easier one to visualize. The labor participation rate of those 65 and older (green arrow) vs. those 25 - 35 (red line). The youth have given up, while the older generation is looking for jobs instead of retiring. So how does this all impact the unemployment rate, the Fed's policy, and gold? If the economic depression continues lurching forward it could create an environment where more and more workers give up looking for work, "helping" the unemployment rate. There is also the lack of hiring, so far, in the residential real estate construction portion of the economy even though the government and Fed have blown up another mini housing bubble that has led to new homes being built. The blue line below shows the recent pick up in housing starts for residential building. The red line shows that the number of people employed in this sector continues to flat line and fall. If the builders ever begin to grow their staff again it would also help the unemployment rate (or perhaps they understand that this is all artificial and temporary? we'll see). The economy could enter an environment where it is in a worse fundamental position and the Fed slows their printing because they "promised" the 6.5% rate was their target. 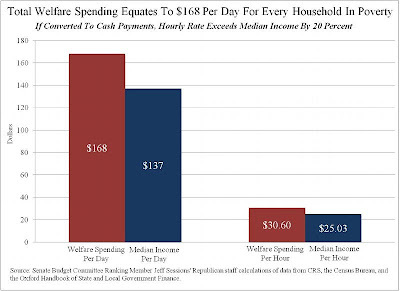 We would have an economy of people that have given up looking for work to collect welfare (see Welfare Vs. Working: Retiring Young In America) and those that are once again employed adding to the housing supply with more homes that we don't need (the banks could just unleash the shadow inventory into the market and we would have enough housing for the next few years). If we were to hit 6.5% unemployment tomorrow (everyone gives up) and the Fed stops printing, where would the fair value of gold be based on the money that has been printed so far? The following chart provides the update. 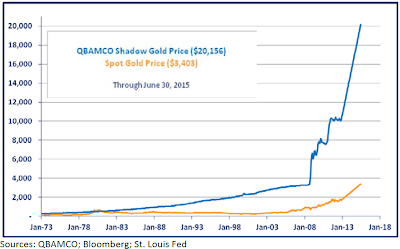 The blue line shows the base money in the system vs. the US gold holdings, essentially what it would take to back the current money supply with gold - simple accounting. That number has now risen to $10,039 for an ounce of gold. The following shows the base money trajectory projected out through 2015 under the new QE-ternity program. You want to sell your gold when the yellow line crosses above the blue line, which has happened twice in the last century (1932 and 1980 - both charts show the 1980 cross over). 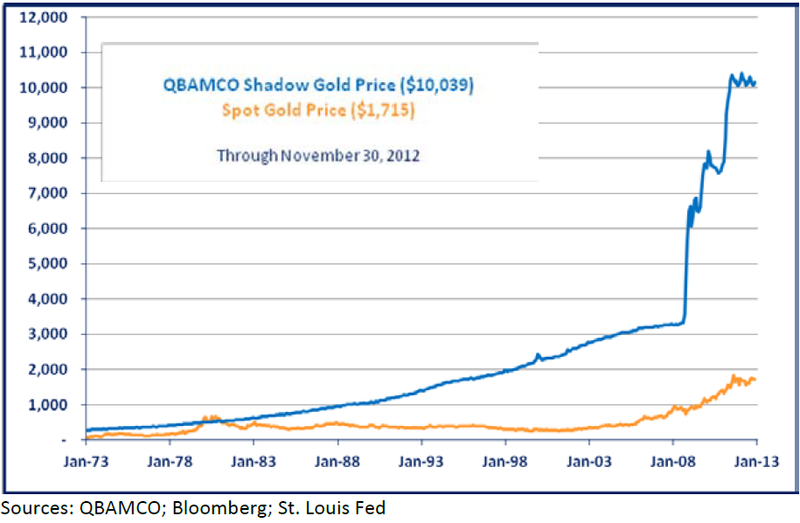 That is the point when gold moves to "overvalued" based on fundamentals. We'll get there again this decade. For the nerds out there like me who spent hours of their youth reading The Hobbit and Lord Of The Rings trilogy (and who will be in the theater this weekend watching The Hobbit), and ALSO for those out there that look and make fun of the people like us as the very strange group we are. One of the remaining pillars who still has an AAA rating and should be rated much closer to junk is the UK. They are just another one of the major developed economies which has no possible way of ever paying off its government debt (without massively devalued British pounds - their currency). This slow and steady deterioration of credit quality is exactly what happened with subprime during the 2006 - 2008 process. Everyone remembers the day Lehman Brothers failed, which was the climax of the subprime multi-year event, but they forget that there were small episodes for years that led up to that moment. Mortgage backed securities laced with toxic subprime loans were rated AAA and valued at 100% all the way up to the end. Then they were downgraded, the veil was pierced, and the value of the debt went into free fall. The same is occurring today with France (recently downgraded), the United States (recently downgraded), Japan (recently downgraded), and the UK (outlook just cut). The price being paid at this moment for the debt of these countries is the highest it has ever been in history (lowest bond yields) at a time when the credit quality of the debt is the lowest it has ever been in history (most likely to default). It is beyond a bubble, it is blind hysteria even worse than the episode in subprime, and it will not end well. When will the "Lehman" moment occur? I have no idea. I'm selling all my developed world government paper and currency now. I would rather sit back and wait for the madness of crowds to run its natural course. I'll buy back in after the collapse, just as some investors, like Kyle Bass, are today with subprime mortgage debt. Staggering piece of data below based on recent research from the Congressional Research Service. They find that an average family living today is better off accumulating the average of all welfare payouts vs. working and collecting the median family income in 2011. The number represents the total payout of welfare programs that pay food assistance, cash assistance, housing costs, and medical costs (essentially all living expenses). The federal money on these programs in 2011 was close to $1 trillion. A family that takes the time to research how much they can make by not working and maximizing their welfare payouts often finds that the monthly payout greatly exceeds the income at a job. With American now entering this new form of retirement, I find it fascinating that people are still confused with last month's election results in America. 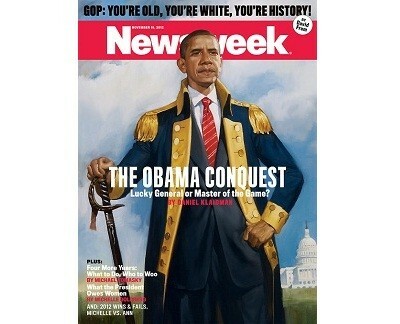 This past week's Newsweek cover sums it up perfect. As expected and discussed last week, the Fed increased the size of its QE-ternity program today from $40 billion per month to $85 billion per month. This means that they will now print money to purchase $40 billion in mortgage bonds and $45 billion in treasury bonds. 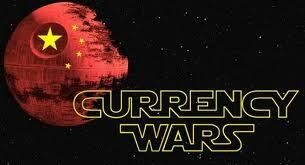 The Currency Wars continue and they are now picking up speed. Look for Japan, the European Union, and the UK to respond as the former powers of the global economy all try to devalue their paper currency against each other to provide an artificial short term stimulus to the economy. The biggest losers of this war will be almost everyone. 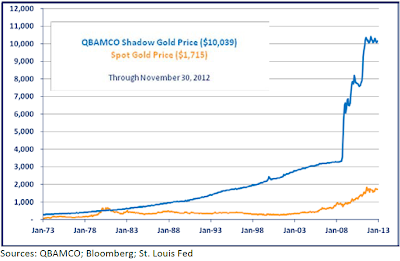 The biggest winners will be the few that understood what was happening and began accumulating precious metals early. A main argument for higher stock prices moving forward in the US is that the average American household has not participated in the rally. 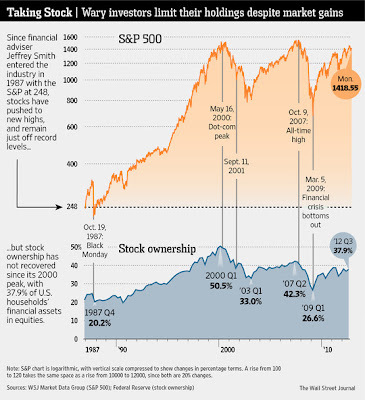 The following excellent chart from the Wall Street Journal shows the price of the S&P 500 since 1987 (orange) vs. the percentage of household assets in the stock market (blue). I want to discuss this concept for a moment because it is both often discussed and important to understand. To begin, this chart does not go back to the beginning of the most recent secular bull market in the early 1980's. 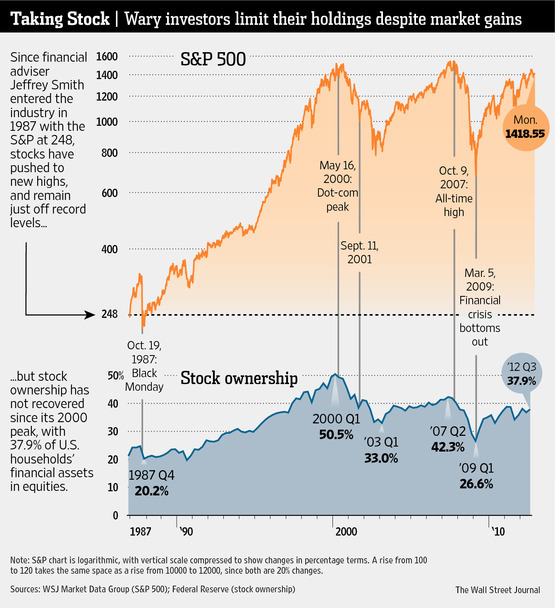 Stock ownership was even further below the 20.2% bottom shown on the graph in 1987. The bull market was already 5 years in at that point so investors were already beginning to tip toe in. A major reason for the move into equities in the early 1980's was the creation of the 401k program. This made investing in stocks a new way to "save" for retirement that had tax advantages. It opened the door to a much larger portion of the country which did not participate in the market in the past. It is also important to briefly point out that the 1987 "bottom" in ownership on the chart was just after the 1987 crash. You can see that as the market rises more average investors enter, and as the market falls/crashes, more sell. This is known as herd behavior, a topic discussed here often. The public is always positioned for the most possible damage at the worst possible time and is usually not in the market at bottoms (at this moment in time this is occurring in the bond market as the average American household has put the majority of their retirement income into the "safety" of bonds at the absolute peak of the market - they will soon once again be slaughtered). These are estimates used to provide an example of what I'm talking about - not actual data (although I'm using the stock data from the WSJ above as reference). So now a financial advisor looks at the above numbers and says that it is a good time to purchase X because he believes that money will be moving toward that asset market from one of the other asset markets and it will push that asset price higher. For example, he'll say that "money will move out of bonds and go back into stocks." This analysis misses a critical piece of information and it is why most investors will be hurt bad in the years ahead. Imagine that you lived in Greece in 2009. You sit down with your financial advisor and have this same conversation using the same percentages above. What happened to the markets in Greece? They were all destroyed. Point out which graph below you would like to have been invested in. Because money did not move back and forth between the three categories - it left the country completely. Capital fled Greece at every asset location when their government debt crisis hit. This is the new normal for investing in the global economy. If your country is bankrupt and has not yet entered its sovereign debt crisis - France, Japan, the UK, United States, your money is not safe in any of the "big 3" investment options. Money will move to where it is treated best. Over the next decade I believe that will be in commodities and emerging markets with strong balance sheets (simultaneously creating stronger currencies). The current bizarre landscape where more government spending and money printing leads to more capital entering the country (see the United States) will reverse. This is the exact opposite of almost every financial forecast for the future, and it has been the blue print for the future here on this site since governments around the world nationalized the financial system and backstopped these paper government promises with a printing press back in 2008. Look for Japan to be the first major tremor to hit. Pay close attention to how capital will leave the country at every asset (stocks, bonds, real estate). 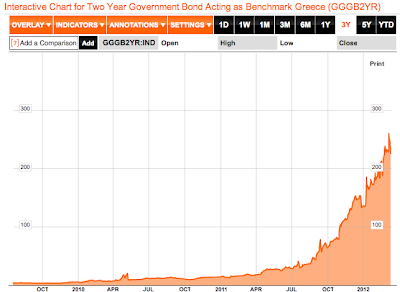 Greece has provided the blue print - make sure you are paying attention. The more the government gets involved with a sector of the economy, the more inefficient and expensive that sector becomes. This can be seen most recently by looking at charts of the cost of tuition at colleges in America at the point when the government entered the student loan market in force. 60 Minutes reviews another major portion of the inefficiency in the cost of health care in America. Costs will continue to skyrocket higher as Obamacare moves into place. Just as with student loans, these costs will continue to be spread out equally across the country on the backs of the American tax payer. Until the system breaks and the Greece moment arrive. Which Government Bond Markets Are Heading Toward Cliff Fastest? 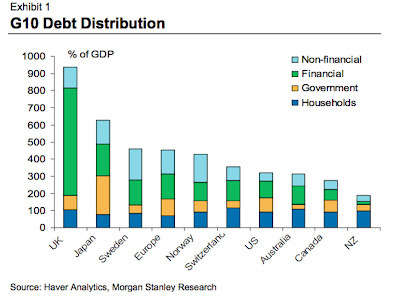 Excellent graph below showing the worst government debt to GDP offenders around the world since 2008. 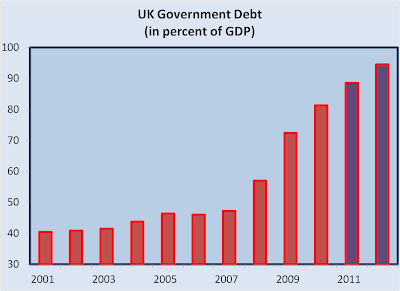 What this means is that since the crisis broke out in 2008, which countries have added the most debt relative to the size of the economy in order to boost/juice/stimulate growth. You see Ireland, Greece, and Spain in the top 4, and the US, Japan, and the UK rounding out the top 6. 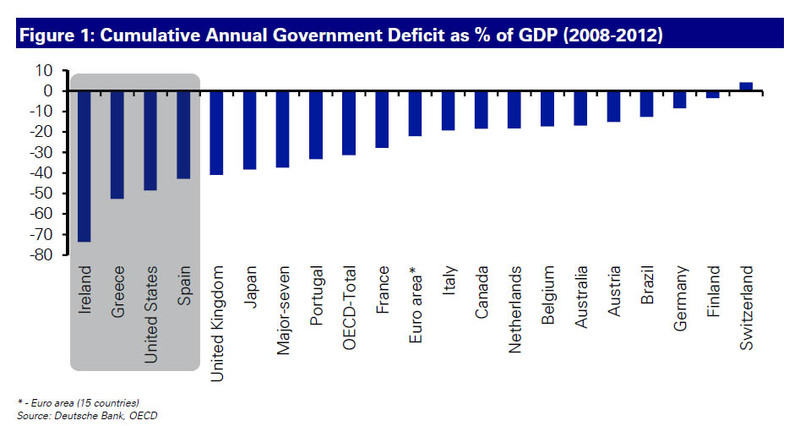 Why have Ireland, Greece, and Spain had such trouble with their funding of this stimulus vs. the other three? Because the bond market decided not to let them play. Soon the bond market will do the same for the US, Japan, and the UK. It is only a matter of which one happens first. 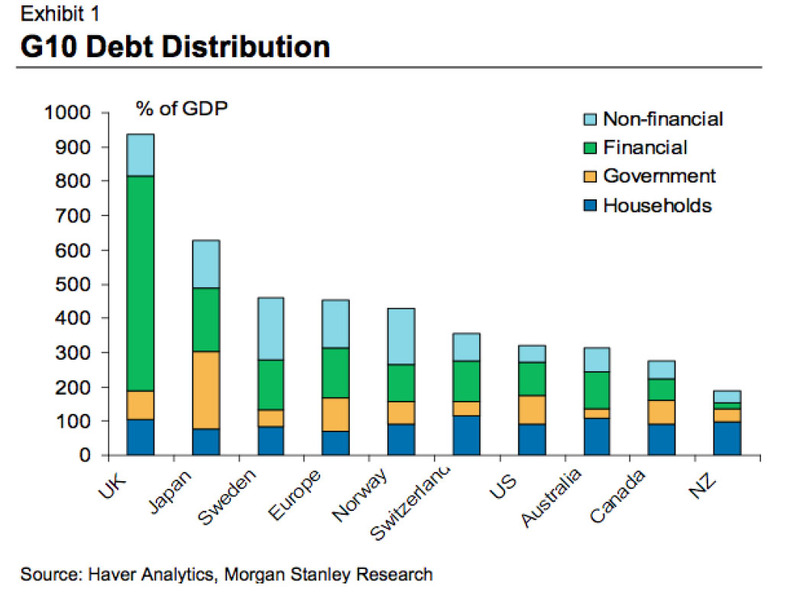 My money is on Japan, but those holding precious metals care little about the order of collapse.